Was the UN-mandated, NATO-led operation in Libya a step forward or a setback for the norm? What implications – positive and/or negative – does the Libya operation carry for RtoP moving forward? What are the responsibilities of the international community as Libya transitions into the post-Gaddafi era? Despite the ending of the NATO mandate in Libya, should the international community continue to play a role in civilian protection? Through an RtoP lens, what lessons can be learned from Libya for future cases where international action – whether non-coercive or coercive – is necessary to protect civilians? The full post, “Civil Society Reflects on RtoP Post-Libya“, includes our review of the international response to the situation and analysis on its implications for RtoP, as well as the reflections on the challenges for the norm post-Libya by the individuals above. We have also published a piece to mark the one-year anniversary of the first protests in Libya, which discusses the difficulties of the transition into the post-Gaddafi era. The one-year anniversary of the first protests in Libya was marked on 17 February 2012. Spurred on by the arrest of a human rights campaigner and emboldened by protests sweeping the Arab world, citizens in the eastern Libyan town of Benghazi hit the streets in a “Day of Rage” exactly one year ago in protest of the now-deceased Colonel Muammar Gaddafi’s 41-year rule. Like Tunisia and Egypt before it, protests spread like wildfire across Libya, with Benghazi becoming the de facto stronghold of the opposition to the Gaddafi regime. As they spread, the crackdown by the Gaddafi regime became more ruthless. The Libyan leader broadcasted his clear intent to commit further widespread human rights violations in a 22 February 2011 speech, calling on his supporters to attack the protesting “cockroaches”, and urging them to “cleanse Libya house by house” until they surrendered. The international community responded in an unprecedented manner with a range of measures within the framework of the Responsibility to Protect, imposing sweeping diplomatic and other non-coercive measures at the national, regional, and international levels. Civil society was quick to label Libya an RtoP situation, with a number of organizations calling for decisive action to prevent atrocities against civilians. Individual states enacted sanctions, asset freezes, and travel bans. Regional organizations such as the League of Arab States (LAS), the Organization of Islamic Cooperation, and the African Union appealed for restraint, with the European Union enacting sweeping sanctions. The UN Security Council (UNSC) imposed an arms embargo, travel ban, and assets freeze, while also referring the situation to the International Criminal Court through the unanimous adoption of UNSC Resolution 1970. The UN General Assembly suspended Libya from the Human Rights Council, after the Geneva-based body requested such an action be taken. As the situation deteriorated further, the LAS and the Gulf Cooperation Council called for more robust measures to be adopted. The regime remained unfazed, intent on committing further atrocities. With sweeping non-coercive measures failing to bring an end to the crackdown, on 17 March 2011, exactly one month after the first protest erupted, the UNSC passed Resolution 1973, which authorized “all necessary measures” to protect Libyan civilians. A Coalition of international states, led by the North Atlantic Treaty Organization (NATO), moved to quickly enforce the mandate on 19 March 2011. The decision was another benchmark for RtoP, as it was the first time the Council had mandated the use of force to protect civilians from one or more of the four crimes under the norm’s framework. Seven months later, after a protracted civil war with devastating consequences for civilians and combatants, Gaddafi was captured and killed on 20 October 2011 by rebel forces, with assistance from NATO airpower. The dictator’s shocking demise spurred the UN’s Office of the High Commissioner for Human Rights, the ICC’s Chief Prosecutor, Human Rights Watch, and Amnesty International to raise suspicions that a war crime was committed. It was a violent end to the old Libya, and a turbulent beginning to the new era. As Libyans celebrated an end to the Gaddafi era, Mahmoud Jibril, the former leader of Libya’s now-provisionally-ruling National Transitional Council (NTC), hailed Gaddafi’s death as an end to “all the evils” in his country. One year on however, evil has not vanished from Libya. Instead, insecurity and lawlessness prevail, and a number of high-profile civil society organizations have documented allegations of widespread human rights violations by Libya’s revolutionaries. According to a 16 February report by Amnesty International (AI), hundreds of armed and “out of control” militias threaten Libya’s transition in the post-Gaddafi era, which the provisional NTC has been unable to rein in. Running street battles often break out between the militias, terrifying and threatening civilians. Revenge attacks and discrimination against known or suspected Gaddafi supporters, as documented by ICRtoP member Human Rights Watch (HRW) in a 22 January report, are commonplace. Clashes between rival militias have erupted in the southeast, and despite NTC forces intervening, have continued. The violence is fueled by easy access to weapons stockpiles, some of which have slipped across Libya’s borders into neighbouring countries. Impunity also reigns. These “out of control” militias, along with some NTC-affiliated military and security entities, have allegedly engaged in ill-treatment, torture, and killings of detainees. Lacking an effective judicial system, these alleged crimes have largely gone unpunished in the new Libya. Detention in these conditions persists for thousands, mostly in centres that are controlled by militias independent of the ruling NTC. A 16 February report by the International Committee of the Red Cross (ICRC) indicated that 8,500 detainees remain in custody in over 60 separate places of detention, most of which are under the control of different authorities. Detention centres in Misrata were appalling enough to cause Médecins Sans Frontières (MSF) to suspend their work in the prisons on 26 January. In a press release, MSF stated that officials from Misrata-based militias that ran the detention centres frequently subjected detainees to torture and denied them medical care. Furthermore, members of MSF staff were repeatedly brought detainees in the middle of an interrogation to be given medical care so that they could be questioned further. 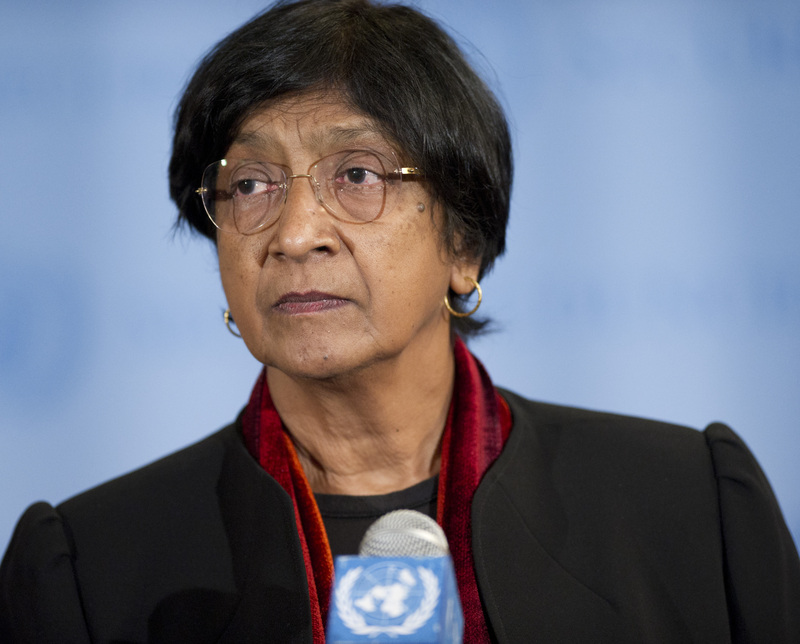 At a UNSC briefing on 25 January, UN High Commissioner for Human Rights Navi Pillay stated that the lack of central oversight “creates an environment conducive to torture and ill-treatment”, and urged the detention centres to be brought under the control of the Ministry of Justice. However, while the NTC has reportedly assumed custody of more detainees, the reports of AI, HRW, and MSF highlight the continued risk of torture and other human rights violations in post-Gaddafi Libya. Despite this, there are glimmers of progress. The citizens of Misrata held Libya’s first real exercise in democracy in 42 years by going to the polls on 20 February to elect a new City Council. The NTC has also vowed for elections in June, along with drafting a new constitution, although no date has been set. These gains are threatened by the fact that Libya’s revolution cities, like Misrata, are outpacing the NTC with reforms and forming nearly autonomous city-states. Reports emerging from Libya in the first months of 2012 are certainly troubling. The struggle to establish security in the new Libya after an eight-month civil war has been compounded by an equally difficult struggle to ensure that human rights are protected, the rule of law is built and respected, and reconciliation is pursued. Moving forward, the country’s authorities, along with partners at the international, regional, and national levels, must work together to ensure both peace and justice as Libya rebuilds. Such a challenge may prove as a great a test for RtoP as its implementation in response to the crackdown nearly one year ago; however only then will the responsibility to protect truly be upheld in the post-Gaddafi era. The United Nations General Assembly voted overwhelmingly in favour of a Saudi-drafted UNGA draft resolution on the situation in Syria on 16 February. 137 states voted in favour, 12 in opposition, and 17 states abstained from voting. Syria, Russia, China, Iran, Venezuela, the Democratic People’s Republic of Korea, Nicaragua, Bolivia, Ecuador, Belarus, Zimbabwe, and Cuba all registered votes against. The resolution calls for the UN and its members to support the League of Arab States’ peace plan in Syria, which provides that President Bashar al-Assad delegate power to deputy in order to begin the process of a political transition. It also condemned the escalating violence in Syria, urged the Syrian authorities to put an end to further violations of human rights, and stressed the need to ensure accountability for all violations, including those that may amount to crimes against humanity. The resolution also calls for the UN Secretary-General to appoint a Special Envoy on Syria, and for the UN to provide technical and material assistance to the League of Arab States. More updates to follow, here and on Twitter. The United Nations General Assembly (UNGA) has scheduled a vote on 16 February at 3:00 pm EST on a new resolution concerning the situation in Syria, drafted and circulated by the Kingdom of Saudi Arabia on 10 February. The UNGA has previously condemned the Syrian government’s crackdown against civilian protesters on 22 November and 19 December 2011, with each urging strong support for regional efforts by the League of Arab States. The Saudi-drafted UNGA draft resolution is similar to the one that was subject to in-depth negotiations and ultimately vetoed by Russia and China at the UN Security Council (UNSC) on 4 February. It also calls on the Secretary-General of the UN, Ban Ki-moon, to support the efforts of the League of Arab States through the appointment of a Special Envoy and technical and material assistance. It is expected that the draft resolution will pass at the 16 February vote. There are no veto rights within the General Assembly, which has crippled efforts to respond to the situation in Syria at the Security Council. The passing of a resolution at the UNGA would increase diplomatic pressure on Assad and throw UN support behind the Arab League peace plan; however the resolution would not be legally binding for UN Member States. The draft was circulated after a Cairo meeting of the League of Arab States on 12 February. The organization passed a resolution which formally backed the Syrian opposition, called for it to unite, and requested that the UN Security Council authorize a joint United Nations-League of Arab States peacekeeping force to protect civilians and oversee a cease-fire. Russian Foreign Minister Sergei Lavrov made his opposition to the idea clear by stating that his country would not support a joint peacekeeping operation unless there was a ceasefire in place between the government and the rebel Free Syrian Army and other armed opposition. China’s Foreign Ministry stated that it supported the League of Arab States’ efforts to resolve the crisis, but did not express whether it would support peacekeepers being deployed in Syria, Reuters reported. Meanwhile, the US administration of President Barack Obama also expressed concerns with peacekeepers being deployed in Syria, among them the challenges in overcoming Russian and Chinese opposition, and gaining Syria’s consent to such a force. There is not, however, any mention of the formation of a joint UN-League of Arab States peacekeeping force in the General Assembly draft resolution. Ahead of vote at the UNGA, UN officials continued to condemn the violence in Syria. UN Special Advisers for the Prevention of Genocide, Dr. Francis Deng, and for the Responsibility to Protect, Dr. Ed Luck, issued a statement on 10 February condemning the recent violence in Homs, which has been reported to have claimed upwards of 300 lives. The Special Advisers warned that such indiscriminate attacks against civilian populations could constitute crimes against humanity. Dr. Luck also warned in a press statement on 14 February that the conflict in Syria was splitting along sectarian lines, with attacks occurring against specific groups. At the 2005 World Summit, Heads of State and Government made a solemn commitment to protect populations from genocide, war crimes, ethnic cleansing and crimes against humanity, including their incitement. They agreed, as well, to utilize the full range of regional and global tools under the United Nations Charter to help protect populations from these crimes. Many of these measures would not require authorization by the Security Council. These would include efforts to build trust among communities within Syria, to facilitate the delivery of humanitarian assistance to those in need, and to encourage regional cooperation in advancing human rights and preventing further rounds of violence against civilian populations. UN High Commissioner for Human Rights Navi Pillay briefed the UNGA on 13 February on the situation in Syria. In her address to the Assembly, Pillay condemned the continued government crackdown in Syria, expressing her “outrage” over the serious violations of human rights that have been committed since March 2011. The High Commissioner stated at the General Assembly that the systematic nature of the government’s response to protests, including it’s shoot-to-kill policy against civilian protesters, its “massive campaign” of arbitrary arrests, detentions, torture and sexual violence, and the high number of children who have been killed by security forces, indicated that crimes against humanity had been perpetrated by Syrian forces. Pillay again encouraged the UNSC to refer the situation in Syria to the International Criminal Court so that the crimes committed do not go unpunished. The High Commissioner also urged the international community to “act now” to uphold its obligations to protect Syrian populations from continued violations of human rights, which she noted the Syrian government had manifestly failed to do. The renewed effort to respond to the situation in Syria through the United Nations comes after Russia and China employed their vetoes to strike down a draft resolution at the Council on 4 February. It appears, however, that France – a permanent member of the Security Council – is holding negotiations with the Russians in order to introduce a new resolution that overcomes Russia’s concerns with previous drafts tabled at the Council. Reuters reported on 15 February that French Foreign Minister Alain Juppé hopes that a new resolution would include the creation of humanitarian corridors in Syria. Juppé argued that the humanitarian zones would serve to alleviate civilian suffering in Syria by allowing inter-governmental and non-governmental aid agencies to deliver food, water and medical services, but would likely have to be protected by armed observers or peacekeepers. Given Russian and Chinese opposition to any form of outside military intervention in Syria over the course of the UN’s efforts to respond to the situation, such a proposition would likely encounter resistance from those Members at the UNSC. Meanwhile, following a Russian delegation’s meeting with President al-Assad of Syria, Chinese Vice Foreign Minister Zhai Jun announced that China would also travel to Syria with an envoy to discuss the situation with the Syrian government. Diplomatic efforts to resolve the crisis continue as violence has escalated steadily since the failed UN Security Council draft resolution on 4 February. The bombardment of Homs by Syrian security and military forces has continued in recent days, and clashes between those forces and the rebel Free Syrian Army have reportedly expanded across the country. New raids were reported in Daraa as well, as the government seeks to extinguish rebellious pockets in major Syrian cities. On 16 February, UN Secretary-General Ban Ki-moon echoed the calls of many of his UN colleagues by stating that there have been “certain” crimes against humanity in Syria, particularly the indiscriminate shelling of civilian areas by Syrian security forces. And according to Amnesty International (AI), such a “diplomatic surge” could not come a moment too soon. In a press release, AI states that as the debate has moved from the Security Council to the General Assembly, the Syrian government has steadily stepped up its attacks, which have resulted in a rising civilian death toll. As such, Ann Harrison, Deputy Director for the Middle East and North Africa for AI, urged the international community to “not stand idly by” as Syrian civilians continued to be targeted by the government in Homs, Hama, and Daraa, Syria. AI and Human Rights Watch issued a joint-letter ahead of the UNGA vote, which urged the UN body’s members to vote in favour of the draft resolution and, “strongly affirm that the vast majority of states have not abandoned the people of Syria”. Post researched and written by Evan Cinq-Mars. Editing by Rachel Shapiro and Megan Schmidt. For the second time since the nearly year-long crackdown in Syria began, Russia and China vetoed a United Nations Security Council draft resolution on the situation. The draft resolution, premised on the 22 January Arab League plan calling for President Assad’s transition from power and the formation of a unity government, was introduced by Morocco, with the support of Western and Arab states, and tabled on 26 January. Extensive negotiations and concessions, however, were not enough to prevent the veto from being employed. Given this failure to reach a consensus, actors at all levels, extending from the national to the international, must re-double their efforts to halt these gross human rights violations in Syria. The Council sat to vote on the resolution at 11:00 a.m. on 4 February. It was uncertain how the vote would unfold in the lead up to the meeting, especially with regards to Russia’s potential veto, and how China, India, South Africa, and Pakistan would vote, particularly as India and South Africa had abstained in a vote on an earlier draft resolution on 4 October 2011. 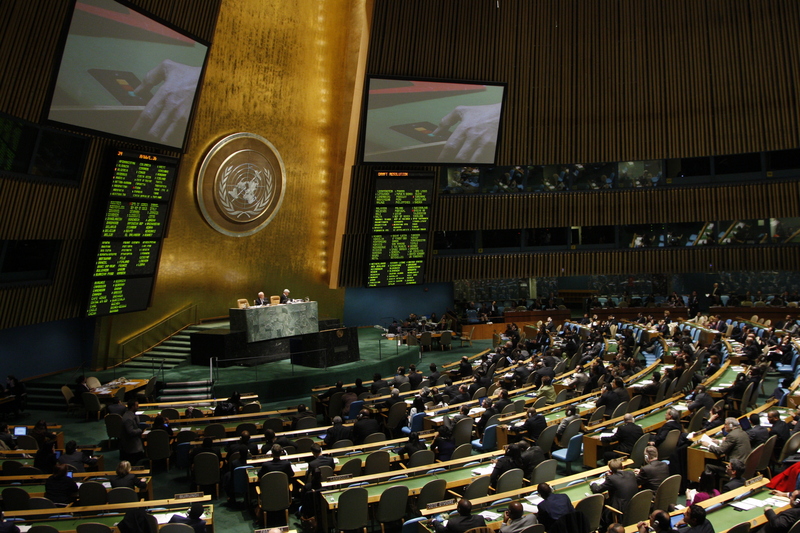 When the vote was called, 13 Security Council members voted in favour of the draft, which included Morocco, India, Pakistan, Colombia, Guatemala, France, Germany, Portugal, the United Kingdom, the United States, Azerbaijan, Togo, and South Africa. Despite this broad support for the draft resolution, Russia and China prevented the Council from taking any action by employing their veto powers. The draft resolution went through a series of negotiations between 27 January and 4 February, as supporters made a number of amendments attempting to appease the “red lines” of the Russian delegation and prevent the use of the veto. Among the provisions dropped were explicit references to the specifics of the Arab League plan regarding President Assad delegation of power. Operative clauses that stated Member States could pursue measures like arms embargoes and economic sanctions in cooperation with the Arab League were also removed from the draft. These amendments were included in the final draft of the resolution. Though Council Members awaited Russian changes ahead of the vote on the evening of 3 February, these amendments did not return to the Council until 4 February, moments ahead of the scheduled vote. According to Reuters, Western diplomats said that the changes were “unacceptable”, and the vote proceeded without them. In the wake of the vote, both Russia and China have sought to defend and explain their use of the veto. 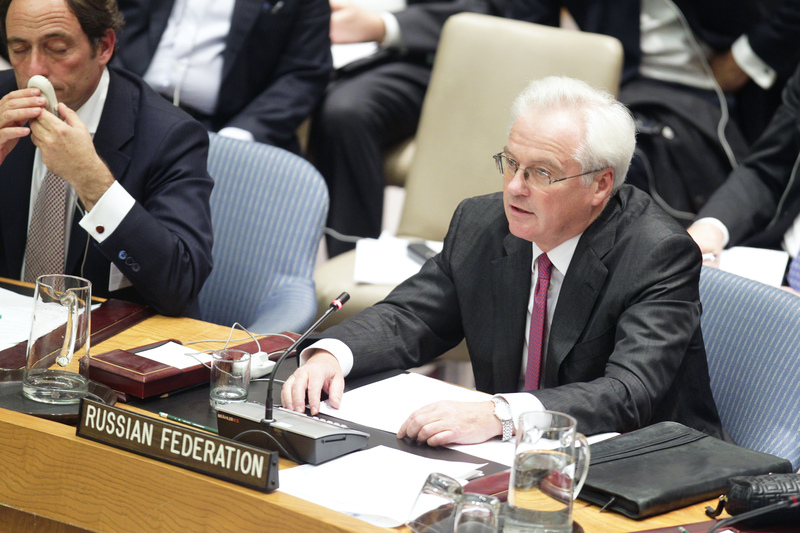 Ambassador Churkin said that Russia was thus opposed to the draft resolution because it was “unbalanced” and did not reflect the amendments it had presented before going to a vote. In an interview with RT on 7 February, Ambassador Churkin stated the resolution could have passed with two or three more days of extended discussions. Russia’s Foreign Minister, Sergei Lavrov, echoed this in his defence of using the veto, stating that it did not impose balanced demands on the armed opposition to cease violence, and that it would have obstructed a Syrian-led political process. Ambassador Li Baodong, Permanent Representative of China to the UN, towed the Russian line at the Council, stating that the resolution put “undue emphasis on pressuring the Syrian government”, which would prejudge the outcome of a Syrian-led political process. Ambassador Baodong said that Council Members were still seriously divided over the draft resolution, and that hastily moving towards a vote without reflecting the amendments made by the Russian delegation ultimately led to the use of their veto. The Ambassador’s statement was quoted near-verbatim in a Xinhua report that explained China’s veto. Council Members who supported the draft resolution were quick to condemn Russia and China in their addresses in the aftermath of the vote. UK’s Permanent Representative, Ambassador Mark Lyall Grant, said that his country was “appalled” that Russia and China would veto an “otherwise-consensus resolution” submitted and supported by a wide array of actors, including a number of regional states. In his statement on behalf of Morocco, which tabled the initial draft resolution, Ambassador Mohammed Loulichki expressed his “great regret and disappointment” that the Council was unable to act unanimously. On 4 October 2011, both India and South Africa abstained from the vote on an earlier draft resolution on the situation in Syria, largely paving the way for the first Russia-China double veto. In a rather surprising move both countries voted in favour of the draft resolution on 4 February, voting separately from Russia and China in the Council. Pakistan also voted in favour of the resolution. Explaining his country’s cautious support for the resolution, Ambassador Hardeep Singh Puri, Permanent Representative of India to the UN, stated that it was “in accordance with our support for the efforts by the Arab League for the peaceful resolution of the crisis through a Syrian-led inclusive political process.” Puri also noted that the resolution strictly ruled out the use of force to respond to the situation, which India stood opposed to in negotiations. Ambassador Baso Sangqu, Permanent Representative of South Africa to the UN, echoed the statement made by Ambassador Puri, noting his country’s support for a Syrian-led process, the emphasis on the Arab League’s involvement, and the restriction against the use of force. Throughout the course of the negotiations, civil society organizations had urged Council members, particularly Russia and China, not to employ their vetoes against the draft resolution. Later, both Amnesty International (AI) and Human Rights Watch (HRW) called the double veto by Russia and China a “betrayal” of the Syrian people. Salil Shetty, AI’s Secretary-General, said in a presser that Russia and China’s use of veto was “completely irresponsible” in the face of an already-watered-down draft resolution. Despite disagreement over the draft resolution, Council members vowed to remain seized of the situation in Syria at the Council. But with the UN Security Council sidelined by the double veto, it remains unclear how the international response to the situation in Syria will unfold. In the mean time, Syrian security forces have stepped up their efforts to quell the opposition, including shelling the city of Homs with artillery fire, leading to many civilian casualties across the country. Russia carried through with its plan to send Minister Lavrov and Mikhail Fradkov, the head of the External Intelligence Agency, to hold talks with President Bashar al-Assad in Damascus. Reuters reported Minister Lavrov as saying that Assad had presented constitutional reforms in their discussions, and that the Syrian President was willing to carry them out in order to end the bloodshed. According to the BBC, Lavrov said that Damascus was ready for a larger Arab League monitoring mission to observe efforts to end the crisis. The killing continued in the wake of Russia’s meet with Assad, however, with reports of continued government shelling in Homs. Meanwhile, Western and Arab states increased diplomatic pressure on the Assad regime. In response to the recent surge in violence, the members of the Gulf Cooperation Council (GCC) have expelled all Syrian ambassadors, recalled their own envoys, and called on the League of Arab States to exercise “all decisive measures” to end the bloodshed in Syria. The United States responded by closing its Embassy in Syria, and a number of Western countries, including United Kingdom and Canada, have ratcheted up diplomatic pressure on the Assad regime and Moscow. UN Officials have also spoken out against the recent violence, with UN Secretary-General Ban Ki-moon condemning the assault of Homs on 7 February, calling it “totally unacceptable before humanity”, and urging the Assad regime to cease using force against civilians. On 8 February, UN High Commissioner for Human Rights Navi Pillay condemned the Syrian government’s indiscriminate attacks against civilians, and reminded the international community of their responsibility to protect Syrian civilians. Pillay’s reminder is all too important: Despite the failure to reach consensus at the UN Security Council, actors at all levels continue to have a responsibility to protect civilians form genocide, crimes against humanity, war crimes, and ethnic cleansing. From the Syrian authorities to regional and international organizations, all must work together to prevent further attacks against Syrian civilians. According to a Reuters report, the UN Security Council will meet on 4 February at 10:00 a.m. to vote on the most recent version of the joint Western-Arab state resolution, which was put “in blue” and circulated to national capitals on 2 February. The Council has debated the draft resolution (original version here) since 27 January. Explainer: What does it mean when a draft resolution at the UN Security Council is “put in blue”? According to Security Council Report’s What’s In Blue, which provides insight into the work of the Council, when members approach the final stage of negotiating a draft resolution, the text is printed in blue ink to indicate that is the final version to be voted on. The Security Council meeting will come on the heels of reports of a massacre in the Syrian city of Homs on 3 February, with government security forces seeking to regain control of areas held by the rebel Free Syrian army. This is the second such time that a massacre has been reported in Homs as the Council has deliberated the draft resolution, with tens of civilians allegedly killed on 27 January. While all 15 members of the Council supposedly support the text of the draft resolution, members were awaiting proposed amendments from Moscow on 3 February. However, according to Reuters, Russia did not present any changes to the document, and it remains unclear how it will vote on 4 February. Meanwhile, the Times of India reported that India’s Permanent Represetative, Ambassador Hardeep Puri, will allegedly vote for the Syria draft resolution at the Council. India’s “change of heart” is a result of the recent and continued violence in the country, the Times of India stated. On 4 October 2011, India abstained from voting on an EU draft resolution that condemned the violence in Syria. As a result of continued negotiations and concessions made by Western and Arab members – including dropping the reference of the involuntarily imposition of an arms embargo and economic sanctions in cooperation with the Arab League – the draft was altered before being put “in blue” and sent to national capitals. Regarding follow-up, operative paragraph 15 has been watered down by removing all reference to “Syria”, and has been amended by deleting the portion of the paragraph that stipulated the Council would act in consultation with the League of Arab States in considering other measures in the event of non-compliance with the resolution. What’s In Blue offers an explainer on the changes, as well as on the status of negotiations ahead of the 4 February vote. UPDATE (04/02/2012 @ 10:00 AM EST): According to the New York Times (with a report from AP), Russian Foreign Minister Sergei Lavrov stated after negotiations with US Secretary of State Hilary Clinton that issues remain regarding the draft resolution. Russia apparently takes issue with the demands for armed groups in the resolution, which it feels have not gone far enough, and that the resolution still “prejudges” the outcome in Syria. Lavrov was quoted as saying that the two issues needed to be amended if the resolution was to be adopted by the Council, and that Russia was not opposed to employing its veto. More updates to follow tomorrow’s Council vote on the resolution. Follow this site and our Twitter handle, @ICRtoP. 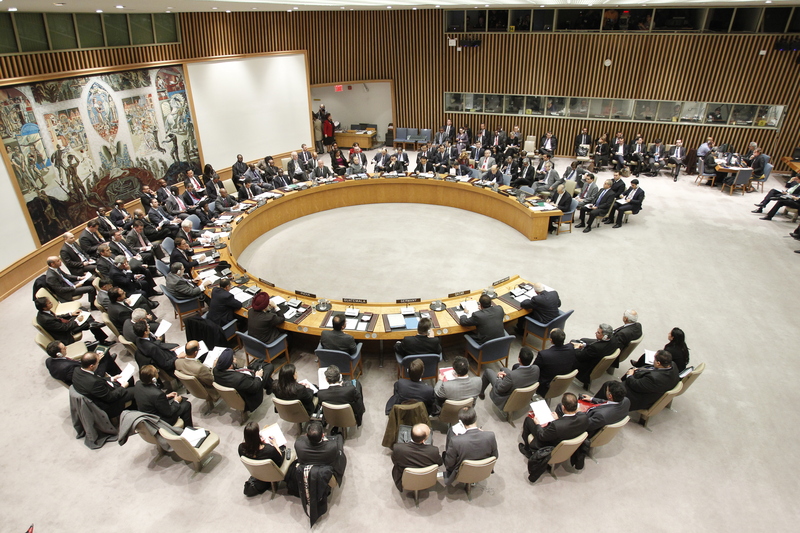 The United Nations Security Council met on 31 January in an extraordinary session on the situation in Syria, with Council members debating the recent draft resolution circulated by Morocco. The Council was briefed by the Sheik Hamad bin Jassim bin Jabr al-Thani, Prime Minister and Minister of Foreign Affairs of Qatar, and Nabil Elaraby, Secretary-General of the League of Arab States. Both al-Thani and Arab League Secretary-General Elaraby were resolute in making clear that the draft resolution being negotiated by the Council was not a pretext for military intervention in Syria, and included no such authorization to use force in the country. Stressing the importance of a peaceful political settlement of the crisis, Elaraby urged the Council in his remarks to support the current Arab League initiative by passing the draft resolution. US Secretary of State Hilary Clinton, French Minister of Foreign Affairs Alain Juppé, UK Foreign Secretary William Hague, and Ministers from Germany, Portugal, Guatemala, and Morocco also addressed the Council, highlighting the importance attached to the Council’s deliberations of this draft resolution on the situation in Syria. Each State has the responsibility to protect its civilian population. Not content with failing to protect its people, the Syrian regime despicably massacres them without restraint. This behavior has direct consequences on international peace and security: thousands of refugees are fleeing the fighting, violations of the sovereignty of neighboring states, heightened ethnic tensions, so many direct repercussions on the stability of an already fragile region. Without even mentioning the responsibility to protect, these regional consequences are enough to establish the Security Council’s responsibility. We understand that popular demands expressed in a pacific manner cannot be equated with a Government that uses force to address those demands. That is why, in an era when the principle of the Responsibility to Protect is being questioned, we are not ashamed to affirm that…we support that principle. Those speaking in support of the resolution were staunch in their condemnation of the Assad regime and the continued violence in country, and put their full weight behind the Arab League plan. In attempting to assuage Russian concerns, Secretary Clinton, Minister Juppé, Minister Hague and other Ministers and Permanent Representatives were adamant that the draft resolution did not authorize the threat or use of force to intervene in Syria, and instead was focused on finding a political settlement that ended the violence and realized the aspirations of the Syrian people. Ambassador Li Baodong, Permanent Representative of China to the UN, affirmed his country’s support of Russia’s position towards the draft resolution, going as far as saying that it “fully supported” Russia’s draft resolution, circulated on 15 December 2011, while only “taking note” of the Arab League plan. The Russian draft, which placed equal blame for the violence on the government and “extremist groups”, was criticized by Council members as being too lenient towards the Assad regime. Both India and South Africa echoed the concerns expressed by Russia and China, and emphasized the need for a Syrian-led process without outside interference. Referencing the intervention in Libya, Ambassador Baso Sanqu, South Africa’s Permanent Representative, also affirmed the need to avoid the use of military force. A recent draft of the resolution, obtained and published by Inner City Press, shows the state of negotiations on its clauses amongst Council members. As evident in the draft, preambulatory paragraph 8, which expresses “grave concern at the continued transfer of weapons into Syria” and “calls on Member States to take necessary steps to prevent such flow of arms”, has been crossed out. Although the text did not explicitly include the imposition of an arms embargo, this change reflects one of Russia’s “red lines” in the negotiations. The Washington Post reported that Russia would continue to sell arms to Syria, with Deputy Defense Minister Anatoly Antonov affirming it would honour its “obligations” to the Assad government. Operative clauses 7 a-c – which provide for the formation of a unity government, the delegation of Assad’s powers to a Deputy, and the holding of free and fair elections – have also been dropped from the text. As a Reuters report indicates, the changes reflect both Russia and China’s uncertainty towards the imposition of a political settlement in Syria by the Arab League and their opposition of forced regime change. The revisions apparently reflect an effort by the United States, European Union Council members, and Arab allies to drop more the more contentious measures of the resolution in exchange for Russian support, according to The Washington Post’s Colum Lynch. The Associated Press reported Council members would continue to discuss the revised draft behind closed doors on 2 February, and it remains unclear whether the changes will be enough to garner Russia’s support despite the revisions. Russia’s threats to abort a binding UN Security Council resolution on Syria for the second time are utterly irresponsible…Russia must work with other Security Council members to pass a strong and legally binding resolution that will help to end the bloodshed and human rights violations in Syria once and for all. The Global Centre for the Responsibility to Protect (GCR2P) also issued a press release on 1 February, which called on members of the Security Council to uphold their Responsibility to Protect. Specifically, GCR2P called on Russia to abstain from using its veto as crimes against humanity continue in Syria. Efforts to sway Security Council members to resolve the crisis and protect Syrian lives turned to South Africa as well, with Daniel Bekele and Philippe Bolopion of Human Rights Watch urging the country “to do the right thing for Syria”. Noting South Africa’s opposition to the West’s implementation of Resolution 1973 in Libya and fear of a similar overreach in Syria, Bekele and Bolopion assert that the current draft resolution “provides absolutely no authorisation for military intervention in Syria.” As such, the authors call on South Africa not to settle political scores with the West over Libya, but to act in support of the Arab League in Syria. 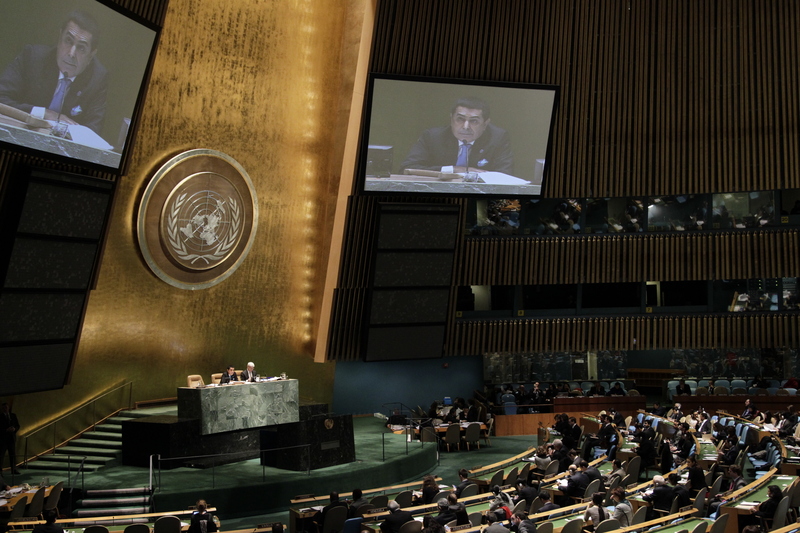 Updates on 2 February Permanent Representative-level negotiations to come shortly. Follow this site, and our Twitter account (@ICRtoP). UPDATE (02/02/2012 @ 10:00 PM EST): The Washington Post reported that Permanent Representatives failed to reach a consensus on the revised draft resolution during negotiations on 2 February. According to the story, however, the document will be “put in blue” – meaning that it could be voted on within 24 hours if no further amendments are made – by the Moroccan mission and sent to national capitals of the Council members for further consideration. Reuters reports that during negotiations, Russia’s Ambassador Vitaly Churkin allegedly threatened to veto any resolution submitted on Friday that included in the text that it “fully supports” the Arab League plan for a political transition in Syria. In the media scrum after the debate, Council members disagreed on the progress made. The Permanent Representatives (PR) of Pakistan and Togo thought that the Council was close to achieving consensus on the draft, but Ambassador Susan Rice, PR of the United States, did not share their opinions. Meanwhile, according to Inner City Press, when asked about how the negotiations went, India’s PR was quoted as saying, “not so well“. Despite being sent to capitals, it remains unclear whether there will be a vote on the resolution before week’s end. The BBC reported that Colombia’s Permanent Representative to the United Nations confirmed that negotiations would continue on Friday, 3 February. 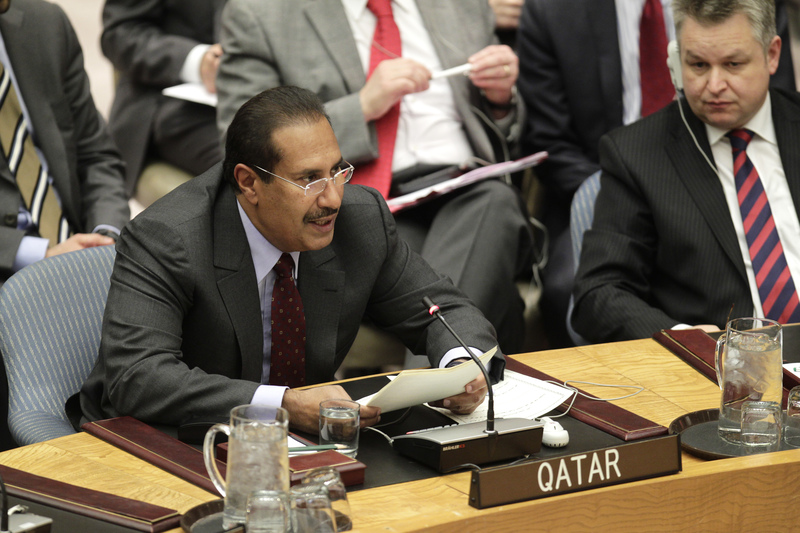 Nabil El Araby, Secretary-General of the Arab League, and Sheikh Hamad bin Jassim bin Jabr al-Thani, Prime Minister (PM) of Qatar and head of the League’s Syria committee, arrived in New York on 29 January, hoping to obtain support for the joint Western-Arab League draft resolution circulated on 27 January. The two are set to brief the Council on 31 January at 3 p.m. on the situation in Syria and the Arab League’s recently proposed initiative to resolve the crisis. The League has called on the Syrian President to immediately hand power over to his deputy in order to begin the process of a political transition, which would include negotiations with the opposition, the formation of a national unity government, and the holding of elections. The Council briefing begins at 3 p.m. Eastern Standard Time, and can be live-streamed here on UN Webcast. We’ll also be following and tweeting the briefing, so be sure to follow @ICRtoP. On 31 January, Gatilov tweeted that pushing the resolution forward was the “path to civil war” in the country The Russian Permanent Representative to the United Nations, Ambassador Vitaly Churkin, echoed this position, but said that his delegation would continue to engage the draft resolution’s co-sponsors. We think that what is contained in this resolution is quite straight forward. There are no sanctions. There is no use of force, or threat of the use of force, as some have alleged. It is primarily a straightforward condemnation of what has transpired, a call upon the government of Syria to adhere to the commitments it made to Arab League and an endorsement of the Arab League plan, which we think is vitally important in the minimum that the Council should do. Ambassador Rice confirmed in the stakeout that negotiations are continuing on the draft resolution at the Expert and Permanent Representative levels ahead of the briefing by the Arab League Secretary-General and Qatari Prime Minister. Western nations have joined the Arab League Secretary-General and Qatari PM in lobbying for the draft resolution among Council Members. It appears that senior governmental officials from Western Council Members will attend the briefing on 31 January to lend their support for the Arab League initiative. US Secretary of State Hilary Clinton confirmed her attendance, publicly calling on the Council to act on the situation in Syria. British Foreign Secretary William Hague also indicated he would attend the Council briefing, while the British government urged Russia not to block efforts to resolve the crisis. It was also reported that French Foreign Minister Alan Juppe will join his Western counterparts at the Council as well. As a result of the lobbying, Agence France Press (AFP) has reported that the “balance within the Security Council has evolved”, with 10 of the 15 Council Members now supporting the draft resolution. With the necessary support in the Council, the Guardian reported that a vote could come on 1 or 2 February. Nine Members of the Council need to vote in favour of a resolution for it to pass, but a Russian or Chinese veto would effectively block Council action. Louis Charbonneau, UN reporter for Reuters, breaks down the possible scenarios of a vote occurring this week, stating that a Russian veto is “very possible”, and, according to U.N. envoys, “Veto-power China, as well as South Africa, India and Pakistan, also have reservations…[and] are expected to follow Russia’s lead when the text is put to a vote”. Meanwhile, regional pressure was increased on the Assad regime to accept the Arab League initiative as well, with Turkish Foreign Minister Ahmet Davutoglu issuing a statement on 29 January on behalf of Turkey and the Gulf Cooperation Council (GCC), which includes Bahrain, Kuwait, Oman, Qatar, Saudi Arabia and the United Arab Emirates. According to Reuters, Iran, a traditionally staunch Syrian ally, also called on the Assad regime to hold free and fair elections, and allow political parties to operate freely in the country. The Arab League recently suspended its monitoring mission in Syria on 28 January amidst growing violence between the rebel Free Syrian Army and Syrian government security forces. According to AlertNet, the Syrian government called the move an effort to influence the UN Security Council’s deliberations and encourage intervention in the country. Meanwhile, a major government-led offensive with tanks and armoured vehicles has taken back the eastern suburbs of Damascus, which were previously controlled by the rebel Free Syrian Army. The New York Times reported on 30 January that Russia had announced it convinced the Assad regime to hold informal negotiations with the opposition in Moscow, but France24 reported that the Syrian National Council (SNC) had not received such an invitation, and would decline to engage in mediation until Assad had stepped down. In an evening announcement made on January 26, the Permanent Mission of France to the United Nations indicated that the UN Security Council will meet today (27 January) at 3 pm to discuss a new draft resolution on the situation in Syria. The draft was written by France and Britain in consultation with Morocco, Qatar (non-Council member), the United States, Germany, and Portugal. Morocco, the only Arab state on the Council, reportedly called for the meeting to be held after briefing Council members, including Russia and China, on 26 January with the new draft resolution. According to Reuters, a vote could come on the draft resolution as early as next week, as it appears that Nabil Elaraby, the Secretary-General of the Arab League, and Sultan Hamad bin Jassim bin Jabr al-Thani, the Qatari Prime Minister and chair of the League’s Syria committee, will present the newest Arab League peace plan at the Security Council on 31 January. The draft resolution follows the recent Arab League plan, adopted on 22 January in Cairo, which calls on President al-Assad to immediately relinquish power to a deputy to pave the way for a peaceful transition through negotiations with the opposition, the formation of a unity government, and the holding of transparent elections with Arab and international monitors. The plan was rejected outright by the Syrian government. Including the provisions for a political roadmap, the resolution also demands that the government withdraw all military and security forces from cities and towns, release all arbitrarily detained persons, and guarantee the freedom of peaceful protesters. All eyes are on the Russian delegation at the Security Council, who has stood by President Assad over the course of the eight month uprising. On top of the recent reports of the selling of 36 combat aircraft to the regime, Russia also vetoed a Security Council resolution on 4 October 2011, and has vehemently opposed sanctions and any form of military intervention. Confirming that the new joint Western-Arab state draft resolution could be a “tough sell”, according to Reuters the same spokesman quoted above said that Russia will continue to actively promote its own draft resolution to the Security Council, which it circulated on 15 December 2011. According to a report from Security Council Report’s What’s In Blue, China, India, Brazil, and South Africa are also cautious towards the draft resolution. While the BRICS agreed to a similar peace proposal on the situation in Yemen in which the government and opposition agreed, their perspectives allegedly differ on the situation in Syria because President Assad has not agreed to the Arab League proposal to begin a political transition. What’s In Blue suggests that divisions may also deepen on the Council regarding a provision on the draft resolution which threatens future measures in “consultation with the League of Arab States” if Syria does not comply with the resolution within 15 days. The new draft will replace a Russian text, which Western diplomats say is too weak and no longer relevant in light of the Arab League call for Assad to hand power to his deputy. As reports of a massacre in Homs emerged earlier today, it seems from above that this afternoon’s Security Council discussion on the new draft resolution will continue to be characterized by the rift between Russia and Western and Arab states on how to respond to the situation in Syria. As crackdown continues and the death toll soars, Council members must work to break this deadlock and move to uphold the responsibility of the international community to protect Syrian populations. Update (27/01/2012 @ 7:00 PM EST): According to the BBC’s Barbara Plett, both Russia and China expressed their skepticism of the joint Western-Arab states’ draft resolution during Council consultations, with China asserting that Syria could not follow the Libya model. While noting that Russia was not opposed to continuing negotiations at the Council, Colum Lynch of the Washington Post reported on the Russian delegation’s “red lines”, which included no arms embargo, sanctions, or imposition of a political solution by the Arab League. At the post-consultation media stakeout, French Permanent Representative Ambassador Gerard Araud affirmed his country’s position that the Arab League’s plan was the only way forward, and that a vote on a resolution was expected within one week. Ambassador Araud did, however, stress the need for consensus within and amongst Council members, which was echoed by Germany’s Permanent Representative, Ambassador Peter Wettig, at the stakeout. Syria’s Permanent Representative, Ambassador Bashar Ja’afari, also spoke to the stakeout, speaking out strongly against the Western and Arab states that supported the draft resolution. Ambassador Ja’afari insisted that his government did not support the Arab League’s recent proposal. However, reporters from Al Jazeera (Benjamin Moran) and the BBC (Barbara Plett) reported that negotiations will continue on the draft resolution on 30 January at 3:00 pm EST, ahead of the presentation to the Security Council by the Secretary-General of the Arab League and the Prime Minister of Qatar on 31 January, with negotiations continuing on 1 February. More to follow. Update (27/01/2012 @ 6:00 PM EST): According to a Reuters report, Russia’s Permanent Representative to the United Nations, Ambassador Vitaly Churkin, expressed his “deep disappointment” with the joint Western-Arab states’ draft resolution. Churkin rejected imposing an outside solution on Syria, and stated that Russia continued to oppose sanctions, an arms embargo, and the use of force to respond to the crisis. Update (27/01/2012 @ 5:00 PM EST): Security Council consultations on the draft resolution have adjourned for the day, which will be followed by a media stakeout. Update (27/01/2012 @ 3:00 PM EST): The closed-door Security Council consultations began at 3 p.m. EST, with the Permanent Mission of the United Kingdom tweeting that the Permanent Representative of Morocco introduced the draft resolution to the Council. Follow this site and our Twitter account for further updates. On January 18th, the Stanley Foundation, Carnegie Corporation of New York and MacArthur Foundation hosted a conference that brought together practitioners from all levels and academics to discuss the Responsibility to Protect (RtoP) for its tenth anniversary. A star-studded cast of panelists addressed the attendees, including UN Secretary-General Ban Ki-moon, Prosecutor-elect of the ICC Fatou Bensouda, Under-Secretary General (USG) for Political Affairs B. Lynn Pascoe, USG for Peacekeeping Operations Hervé Ladsous, USG, Executive Director of UN Women Michele Bachelet, and Assistant Secretary-General for Human Rights Ivan Šimonovic. Civil society was also well-represented among the panelists, including Louise Arbour, President and CEO of the International Crisis Group, Noel Morada, Executive Director of the Asia-Pacific Centre for the Responsibility to Protect – both ICRtoP members – and Simon Adams, Executive Director of the Global Centre for the Responsibility to Protect. Marking the tenth anniversary of the publication of the ICISS report, the conference was a significant and timely review of the past, present and future of the Responsibility to Protect (RtoP). With the recent situations in Côte d’Ivoire and Libya, the conference served as an important forum to discuss, debate and better understand the ‘lessons learned’ from the manner in which the international community responded to those situations. R2P: The Next Decade was also an honest forum for reflection on the implications of the above situations for the norm moving forward, particularly with the ongoing violence in the Sudans and Syria. The conference was live-streamed on Fora.tv, and was live-tweeted by a number of organizations and individuals (including ICRtoP) on the #R2P10 hashtag. In this post, we walk you through the major themes discussed at R2P: The Next Decade, featuring important commentary from the panelists, and links to videos and tweets. For more important thoughts from those live-tweeting the conference, see our Tweeting R2P: The Next Decade post. At the same panel, Ramesh Thakur, a former member of ICISS, responded to questions regarding the pedigree of the norm by raising the important point that ‘RtoP as a ‘northern concept’ is not correct…the protection of peoples is reflected within a diverse array of cultures and religions’. In a debate that erupted at the same panel on the norm’s status as a ‘tool’ or a ‘principle’, Dr. Ed Luck, the Secretary-General’s Adviser on the Responsibility to Protect, refuted the idea that RtoP is a tool, stating that ‘tools are used whenever it is handy’ and ‘can serve other agendas’. Instead, Dr. Luck asserted that ‘RtoP is a principle with a number of tools at its disposal’ to respond to very different situations. At the final panel of the day – R2P in 2022 – Hervé Ladsous, the USG for Peacekeeping Operations, echoed the call of the Secretary-General to make 2012 the ‘year of prevention’ by stressing the importance of ensuring national governments possess the capacities to prevent the four RtoP crimes from occurring, consistent with RtoP’s 1st pillar. In bringing practitioners and academics together, R2P: The Next Decade was an enlightening and honest forum for debate and discussion on the norm itself, leaving attendees with a more holistic picture of its formation, it’s implementation, and its added-value. The day ended in with what MacArthur Foundation Senior Vice President Barry Lowenkron called ‘sober optimism’: A recognition of the progress that has been made with RtoP, the great potential for the norm’s future, but an awareness of the challenges that RtoP supporters faced in realizing that potential. In short, echoing Secretary-General Ban Ki-moon, everyone at the conference was left knowing that while much work is to be done, RtoP is indeed ‘here to stay’. Prosecutor-elect of the ICC Fatou Bensouda offered her insight on the relationship between the Responsibility to Protect and the International Criminal Court (a topic we’ll be exploring further on this blog, so follow this site). Speaking at the final panel, R2P in 2022 , Bensouda suggested that ‘holding leaders accountable for RtoP crimes will have a deterrent effect on others who may be considering their commission’. As such, the incoming Prosecutor was firm in asserting that the ICC was a viable tool in the RtoP framework. Important questions were raised at the panel on R2P as a Tool – Indentifying Past and Potential Added Value chaired by Louise Arbour, the President and CEO of the International Crisis Group. Arbour raised concerns about the Court’s relationship with the UN Security Council, particularly the Council’s power to refer situations to the ICC despite the fact that three veto-wielding permanent members – the United States, Russia and China – have not ratified the Rome Statute. The International Crisis Group President also worried about the efficacy of ICC referrals in the midst of hostilities in country-specific situations. Luck shared Arbour’s concerns, but responded by asserting the importance of the ICC ‘as one of the few tools we have to remind leaders of accountability for the commitment of RtoP crimes’. The lively debate on the relationship of the RtoP and the ICC was an important theme at the conference, and attendees left with compelling points to consider how the ICC fits into RtoP framework and its role in preventing and responding to the four RtoP crimes. The role of regional and sub-regional organizations in the RtoP framework was discussed at length at the conference, particularly regarding their ability to confer legitimacy to the international community’s efforts to respond to country-specific situations. While touting their preventive and response potential, Francis Deng, Special Adviser to the Secretary-General on the Prevention of Genocide, noted the need to build and strengthen the capacities of regional and sub-regional organizations in order to implement RtoP, stating, ‘While there is a lot to be said for regional organizations, there are weaknesses with their capacities even if they offer legitimacy’. This was a common thread in last year’s General Assembly informal interactive dialogue on RtoP, which explored the role of regional and sub-regional organizations. For more information please see our report. Liberata Mulamula, Former Executive Secretary of the International Conference on the Great Lakes Region (ICGLR), stressed how RtoP had been brought ‘home’ by the sub-regional organization at R2P – Policy Approaches Since 2005 in DRC, Kenya, Kyrgyzstan, and Libya, which has been a significant factor in how engaged the ICGLR has been on the prevention of genocide and mass atrocities. At the same panel, Knut Vollebaek, the High Commissioner on National Minorities for the Organization for Security and Cooperation in Europe (OSCE), indicated that while the European body does not directly use RtoP language in its work, he believed that it is ripe for institutionalizing the norm. There was widespread agreement at R2P: The Next Decade of the critical role that can be played by civil society in upholding the RtoP. The involvement of the International Crisis Group, the Global Centre for the Responsibility to Protect, the Asia-Pacific Centre for the Responsibility to Protect, and a number of academics confirmed the importance of civil society in furthering the global discourse on the norm in all regions. In his keynote address, the Secretary-General noted the importance of civil society in stating that the four RtoP crimes are unlikely to occur where ‘civil society is robust’. The Secretary-General also affirmed the importance of the United Nations working in collaboration with civil society even in times of crisis, highlighting the role that civil society organizations can play in mitigating violence in both Syria and South Sudan. In calling for 2012 to be the ‘year of prevention’, the Secretary-General clearly sees an important role for civil society in the RtoP preventive framework, which was echoed by speakers in a number of different conference panels. As Gareth Evans, the former Australian foreign minister who is one of the intellectual fathers of the Responsibility to Protect put it, “Libya is a textbook case for the application of the R2P.” He’s right. The intervention happened quickly, helped avoid a potential mass atrocity in Benghazi, and had the formal backing of the Security Council. This is pretty much how it is supposed to work. But success in Libya may have come at the expense of intervention (even non-military intervention) in Syria. NATO’s interpretation of the Security Council mandate helped it achieve its goals with efficiency, but it poisoned any chance that the Security Council would coalesce around R2P when a future crisis arose. “Syria is the collateral victim of Libya the same way that Rwanda was the collateral victim of Somalia,” said Jean Marie Guehenno, the longtime head of UN Peacekeeping. In other words, just as the Black Hawk Down made western powers wary of even contemplating a humanitarian intervention in Rwanda three years later, the steamrolling of non-western interests in the execution of the Libyan intervention is coloring Russia, China other non-western powers’ approach to Syria. This was reflected in the comments made by Permanent Representative of India to the United Nations, Hardeep Singh Puri, in the aftermath of the Secretary General’s keynote to the conference, who questioned whether the international had to ‘step in through the use of coercive force’. The Ambassador would later share his thoughts on RtoP and the situation in Libya in an interview with the Stanley Foundation. Despite the Secretary-General’s pleas to the regime of Bashar al-Assad to cease it’s crackdown against civilian protesters, expressed in this tweet, a consensus seemed to emerge at R2P: The Next Decade that the manner in which Resolution 1973 was implemented will be a deterrent to more robust action on behalf of the Security Council. Another theme of conversation at R2P: The Next Decade was Brazil’s ‘responsibility while protecting’ (RwP) concept, which it has officially circulated to the United Nations Security Council and General Assembly. Brazil’s Permanent Representative to the UN, Ambassador Maria Luiza Ribeiro Viotti, was a speaker for the R2P in 2022 panel, and explored the concept further, stating that Libya was a ‘defining moment’ that informed RwP’s elaboration. While she recognized that ‘stronger measures were necessary’ to send a message to the Gaddafi regime to cease violence against protesters, the Brazilian mission felt that the Security Council’s adoption of Resolution 1973 authorized a ‘blank cheque with no control over what was to be done or who was to do it’ in Libya. Ambassador Viotti also expressed the fact that her country, along with others at the Council, felt ‘in the dark’ with regards to the Libya operation. As a direct result, the Brazilian President, Dilma Roussef, elaborated the need for ‘responsibility while protecting’ at the opening of the 66th session of the General Assembly, which Ambassador Viotti expressed was to show ‘how important our concerns with Libya were’. As evident in her segment of the final panel, Brazil’s objective with its ‘responsibility while protecting’ concept, is to reassess the manner in which the use of force is employed to protect civilians. This is particularly timely as the General Assembly is set to discuss the 3rd pillar of RtoP – timely and decisive action – in 2012. While supporting the RwP idea in principle, both Dr. Ed Luck and Gareth Evans were cautious about Brazil’s desire to sequence the pillars of RtoP in responding to any particular country-specific situation. Luck asserted that RtoP’s pillars ‘are parallel’ and that the international community must be preparing for contingencies through all three at local, regional and global levels. Evans firmly echoed this by stating that the danger of the Brazilian initiative was its emphasis on the need for the pillars to be chronological, which he said ‘cannot be the case’. In the question period to the final panel, Lt. Gen (Ret’d) Senator Romeo Dallaire raised concerns that Brazil’s RwP would lead to a ‘dissecting of RtoP to death’ that might lead to inaction in country-specific cases. Nonetheless, the attention given to Brazil’s RwP concept at R2P: The Next Decade provides a fairly certain forecast that it will motivate reflection during the General Assembly’s informal interactive dialogue on RtoP’s 3rd pillar this year, and be integral to the norm’s development moving into the next decade. Our congratulations and sincere thanks to the three sponsors for organizing and hosting R2P: The Next Decade.